One day, all buildings will be giant display screens. Not building with display screens attached or stuck on the front like in Tokyo, but buildings as a display material with data networked into the architecture itself. The inside of the building the working process, the data, the movement of people in space will be embedded into the architecture via technology, sensors and computers. The building will become a living sculptural entity a display material. In order for this to have we will also need a new type of display material a new polymer based technology. It has yet to be invented. But here is a simulation of data of this experience using live Bristol data. A polymer display ball or intelligent material would allow the creation of a datascape of gathered assets, which could contain narrative for creating understanding. Translating what we gather into something we understand or at least into something we can experience. The increase of technology infrastructure in the daily existence of a city means that technology will, more than ever be everywhere in our environment. Data mining will be part of the fabric of the landscape. Everything is or will be tracked, cctv, car sensors, tracking inside our phones and id card movement tracking in the guise of anti- terror activity. The patterns we make, the forces we weave, are all being networked into retrievable data structures that can be re-imagined and sourced for information. These patterns all disclose new ways of seeing the world. My recent experiments at the Watershed have been investigating this concept of data in the public domain. There is loads of data out there already. The data is like a medium is malleable, it is problematic to work with, and in some cases it is protected by the data protection act. 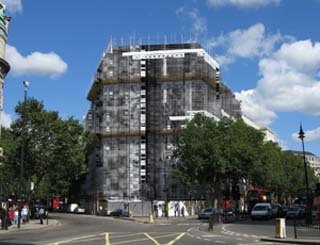 The work “Publicity” (http://www.stanza.co.uk/publicity/index.html) explores placing the inside data of the buildings onto the outside of the building it uses public domain data. Exploring the notion of who owns the data and the intelligent building. Most buildings have CCTV and they use it to observe the people inside the space, ie the public. In this artwork I use the technology in the building to broadcast all the information outside over the internet into the public domain. 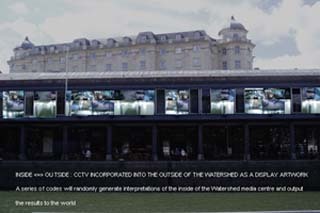 An experimental relay was adapted from the Watersheds CCTV live footage of the general public entering the Watershed gallery. Sensity artworks are made from the data that is collected across the urban and environment infrastructure. A network of sensors, some fixed, and some embedded, collects data which is then published online. The sensors then interpret the micro-data of the city. The output from the sensors will be display the emotional state of the city online and the information will be used to create installations and sculptural artefacts. These artworks made will represent the movement of people, pollution in the air, the vibrations and sounds of buildings, they will be in effect emergent social sculptures visualising the emotional state of the city. Sensity is an open social sculpture that informs the world and creates new meaningful experiences. A first working prototype is in development which will be embedded into the Watershed. It will bring the building alive. Or rather it will be a live representation of the whole space monitoring environmental data to make visualizations. Indeed as I mentioned above, the city is already scattered with technology used for surveillance. I have recently added to my works in cctv and surveillance pieces by making a series of new works. Anyway during my last visit to the Watershed I got side tracked trying to make the next version of my robot called “The mating Game”. I have been buying robots off Ebay and messing about with the electronics. So far I have made a multi robot piece using ten robots in a mating ritual. They are basically acting out a courting ritual and generating sounds depending on their position. You can see a series of videos online of the early installation set up. (http://www.stanza.co.uk/robotsmating/mate/index.html). You are currently browsing the News of Recent Exhibitions by Stanza blog archives for December, 2007.